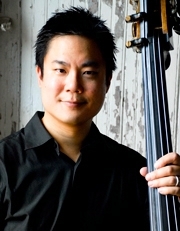 Double bassist Owen Lee has garnered acclaim as a soloist, chamber musician, teacher and (since 1996) as Principal Bass of the Cincinnati Symphony Orchestra. Lee is heard regularly as a soloist with orchestras including the Cincinnati Symphony Orchestra, Scottish Chamber Orchestra, Chautauqua Symphony Orchestra and the New World Symphony in Miami and on tour to New York's Lincoln Center. Lee’s prizes in competitions include First Prize at the 1995 International Society of Bassists Competition and Fourth Prize at the 1992 Irving M. Klein International String Competition in San Francisco. He has recorded the Misek Sonata No.2 and Bach Suites No.3 and No.5 for Boston Records. He can also be heard on all of the Cincinnati Symphony Orchestra's numerous recordings for Telarc International since 1996, most notably the prominent bass solos in Prokofiev's Lt. Kije Suite, Shostakovich's 15th Symphony, Mahler's 10th Symphony and Britten's Young Person's Guide to the Orchestra. Lee’s extensive international chamber music experience includes three summers as the bassist of the Marlboro Festival. While there, he performed with Richard Stoltzman, Midori, Nobuko Imai, Bruno Canino, Pierre-Laurent Aimard, and members of the Beaux Arts Trio, Guarneri Quartet and Juilliard Quartet. Lee has also performed with the Tokyo String Quartet on tour to Mexico, the Opus One, Miami and Miro Quartets, Andre Watts, Yefim Bronfman, Jaime Laredo, Ida Kavafian, Sharon Robinson, Eugenia Zukerman, the Bravo! Vail Valley Music Festival, Mainly Mozart Festival, Ojai Festival, and on tour in Europe and China. Lee was a member of the Houston Symphony under Christoph Eschenbach from 1993-96. In addition to his work with the Cincinnati Symphony Orchestra, Lee has performed as Guest Principal Bass with the National Arts Centre Orchestra (Ottawa), Shanghai Symphony Orchestra and Hong Kong Philharmonic, and as Assistant Principal Bass of Gerard Schwarz's Emmy Award winning All-Star Orchestra for PBS. During his summer vacation, Lee serves as Principal Bass of the Chautauqua Symphony Orchestra. In addition to his performing career, Lee is a highly sought after teacher, and serves on the faculties of CCM and Chautauqua School of Music. He has taught masterclasses at Curtis, Juilliard, Yale, IU, USC, Sydney Conservatorium, McGill University, Beijing Central Conservatory, Shanghai Conservatory and Hong Kong Academy for the Performing Arts. His students can be found in orchestras throughout the world. Lee is a graduate of the University of Southern California. His teachers were Dennis Trembly, Paul Ellison, Edwin Barker, David Soyer, Nico Abondolo, Julius Levine and David Young.